The Sam2 6.9 from FOCUS is their top of the range, long travel eMTB. It’s adorned with the very best in components; forks, shock, wheelset, gearing, braking…the Sam2 6.9 has it all! Furthermore, this eMTB is no ordinary creature. Consequently, it’s hungry for the trails, and wants to show off! Power delivery is by the powerful 70Nm Shimano E8000 drive with a huge 170mm of travel. 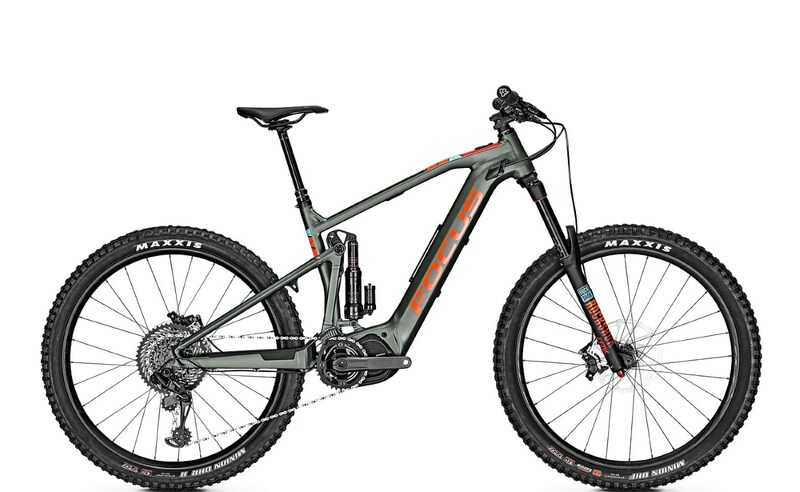 As a result, this eMTB will conquer even the most demanding alpine trails. It’s one of three models within the Sam2 range, and represents the top spec, the others being the Sam2 6.7 and the Sam2 6.8. No obstacle is too great a challenge for the Sam2 6.9. Awesome on the downhills, equally hungry on the uphill. This e-Enduro MTB is insatiable. More thrills, more excitement and greater fun is what this e-bike delivers every single time. No more pushing up the steep inclines, the superbly performing Shimano E8000 motor will provide all the assistance required. There will be no holding back. Shimano’s eMTB motor, the E8000 delivering around 70Nm+ of torque is the powerhouse beneath the Sam2 6.9. It’s light at 2.8Kg, compact and slim. It’s Q Factor is identical to conventional cycles, and as a consequence, the bike feels very natural to ride. Furthermore, the motor design facilitates a shorter chainstay length, comparable to a conventional bike. For that reason, the E8000 integrates perfectly, providing a sleek and natural look. As a result, the ride feels very natural, just like a conventional eMTB. Three power settings feature on the E8000 with a walk assist function too. Assistance levels on the Sam2 6.9 operate via a Firebolt switch on the left-hand side of the bars. A compact yet clear LCD offers all the necessary information, sitting out of harms way adjacent to the handlebar stem. The Sam2 6.9 sports a totally unique, FOCUS designed Dual Battery system. It’s called the T.E.C. (Tailored Energy Concept) system. The addition of a second battery increases capacity to a huge 756Wh for immense range. This is achievable by mounting another battery, which connects very simply, on the down-tube. If an additional battery isn’t required, there’s room for the attachment of a water bottle if desired, with its own compartment on the cage for carrying tubes or tools. Both the battery and bottle cage attach quickly and easily without any fuss. This nimble eMTB has the awesome SRAM GX Eagle 12-speed derailleur for decisive and immediate gear shifting. Coupled with a huge range 10-50T cassette ensures superb hill-climbing. The front chainring is 38T, facilitating a natural riding experience. Front suspension is provided via a very high spec pair of RockShox Lyrik RC2 forks with 170mm travel. No bump or hollow will stop this powerhouse in its tracks. On the rear is an equally nice RockShox Super Deluxe RC3 to gobble up all the nasty undulations. RockShox’s Reverb Stealth dropper seat-post internally routed, ensures total control over riding position on the descends. A highly resilient and stunning Race Face Turbine wheelset ensures huge strength and reliability. This is complemented by a pair of Maxxis 2.6″ tyres. DHF’s on the front, DHR II’s on the rear. They ensure superb grip even under the most challenging terrain. A super light alloy frame and Acros BlockLock headset ensure reliable and resilient handling. Consequently, there’s a high degree of maneuverability and stability. A very smart pair of Shimano Zee hydraulic disc brakes are highly effective and offer powerful yet controlled braking actions. The Sam2 6.9 is certainly at the top of its game. As well as exuding class and features, above all, it offers a well balanced and very natural ride. The range of Sam2 eMTBs combine Shimano’s finest drive with with an optional dual battery for a very unique experience.